Census figures indicate that the number of Hispanics speaking Spanish at home has risen from 10.2 million in 1980 to 24.7 million in 2000 (see Table 1). This growth has motivated concerns about the adoption of English by immigrants from Spanish speaking nations. It has also generated interest in the news media and among advertisers seeking the most effective means to communicate with this growing population. However, many of those Spanish speakers also know English to varying degrees, and similarly, many Hispanics categorized as English speakers also speak some Spanish. 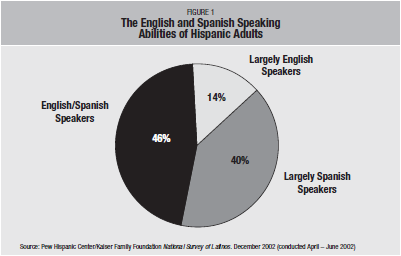 The 2002 National Survey of Latinos allows exploration of the extent of English/Spanish bilingualism and other language usage patterns among Hispanics. It is important to note that this brief categorizes Hispanic adults solely on the basis of their spoken language abilities. Information on reading proficiencies and language usage is presented, but Latino adults are grouped only using information on speaking skills. Other Pew Hispanic Center/Kaiser Family Foundation reports divide Latinos on the basis of “language dominance” (Pew Hispanic Center/Kaiser Family Foundation 2002). “Language dominance” includes both reading and speaking abilities, a different construction than that used herein. It is worthwhile to examine the speaking abilities of Latinos for both an intrinsic interest, as well as comparability to other sources of information on language abilities. Much of social interaction is conducted orally. Furthermore, evidence suggests that the labor market payoff s to oral language abilities exceed the payoff to literal language skills, at least for English in the U.S. (Gonzalez 2000; Carnevale, Fry, and Lowell 2001). Finally, the surveys and censuses conducted by the U.S. Census Bureau only inquire about spoken English ability, thus it is illuminating to analyze the 2002 National Survey of Latinos in a similar fashion. The 2002 National Survey of Latinos provides an estimate of the prevalence of bilingualism among Hispanic adults only. Census data suggest that English/ Spanish bilingualism is more prevalent among Hispanic children than Hispanic adults. In 2000, reportedly, 59% of Hispanic children spoke Spanish at home, and spoke English either “well” or “very well,” in comparison to 53% of Hispanic adults. Thus, among the entire Hispanic population, children and adults, 46% is probably a lowerbound estimate of the prevalence of bilingualism in terms of speaking abilities. Although adult English/Spanish bilingual Latinos have some proficiency in speaking both English and Spanish, they tend to use the languages differently depending on the setting. English is far and away the dominant language of U.S. commerce and trade, and dominates U.S. workplaces. English/Spanish bilingual Latinos report that they largely speak English in the workplace. About 60% of bilingual Hispanic workers usually speak more English than Spanish at work (29%), or use only English at work (33%). Widespread Spanish language usage at work is relatively rare among bilingual workers. About one in ten report speaking “more Spanish than English” or “only Spanish” at work (see Figure 3). English/Spanish bilingual Hispanics seem to be markedly different from the wider Hispanic adult population in their mass media preferences. The survey asked respondents whether they typically received news (via TV or radio) in English or Spanish. Almost 40% of all Latino adults said either “only Spanish” or “more Spanish than English,” reflecting the usage patterns of Latino adults with little speaking ability in English. Bilingual Latinos extensively use English to obtain news broadcasts, as Figure 3 illustrates. Nearly five in ten bilingual Hispanics hear news in “English only” or “more English than Spanish.” Less than a fifth reported obtaining news in “only Spanish” or “more Spanish than English.” So the preponderance of bilingual speaking Latinos either obtains news in English, or does not express an exclusive preference for hearing news in Spanish. 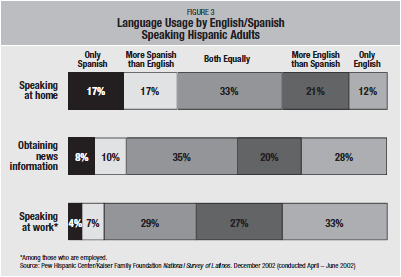 At home English/Spanish speaking Latinos are about evenly divided in their use of Spanish and English (see Figure 3). About a third either speaks more Spanish than English (17%) or only speaks Spanish at home (17%). And, about a third speaks more English than Spanish (21%) or only English at home (12%). The remaining third uses Spanish and English equally at home. The characteristics of Latino adults often vary markedly by their language skills. This section compares the characteristics of English/Spanish speakers (46%) to those of largely English speakers (14%) and largely Spanish speakers (40%). The defining demographic characteristic of these language groups is their generational standing. Almost all (97%) Latinos who only speak Spanish were born in a foreign country or in Puerto Rico (see Table 2). Similarly, by an overwhelming margin (93%), those who speak only English were born in the United States, and nearly two out of three are third generation or higher—they were born in the United States, and both their parents were native born as well. Latino bilingual speakers are about evenly divided between those who are native born and those who are not. Nearly a third of bilingual speaking Latinos are second generation—they were born in the United States with at least one foreign-born parent. The current wave of Latino immigration is sufficiently recent that it is impossible to make definitive statements about how language use will evolve across generations for the newcomers’ off spring. The Latino third generation is almost entirely made up of individuals whose ancestry in this country dates back before immigration flows began to mount significantly in the 1970s. And, two-thirds of second-generation Latinos are under the age of 18 years old (Suro and Passel 2003). Nonetheless, the language pattern developing among Latino adults seems similar to the patterns reported for generations of other ethnic groups in the United States. This country has been described as a “veritable cemetery of foreign languages,” where immigrants retain the dominant language of their country of birth, but by the third generation knowledge of the foreign language has become effectively extinct and proficiency in English has become universal (Portes and Hao 1998). Although language proficiency in the first generation is overwhelmingly Spanish (62%) or bilingual (37%), the second generation is overwhelmingly proficient in English. The second generation is comprised of largely English speakers (21%) and English/Spanish bilingual speakers (74%), with only a small fraction that largely speaks Spanish (6%). The different language groupings also show somewhat diff erent age characteristics (see Table 2). Spanish speaking Latinos tend to be older, bilingual English/Spanish Latinos are younger, and a large portion of the adult Hispanics who are largely English speaking also tends to be young. Examining the characteristics of immigrant Latino adults, there are clear differences between English/Spanish bilingual Latinos and those who largely have only Spanish fluency. Bilingual immigrant adults are much more likely than Spanish speakers to have arrived in the U.S. during their childhood. Half of bilingual immigrant adults arrived in the U.S. before adulthood. Exposure to U.S. schools and the dominant English culture and media at early ages likely facilitates the acquisition of English speaking skills. Bilingual immigrant adults have also been in the U.S. longer than their Spanish monolingual counterparts. Two thirds of bilingual immigrant adults have been in the U.S. for more than 12 years, in comparison to 45% of Spanish speaking immigrant adults. Bilingual speaking Hispanics are more economically and educationally successful, on average, than their largely Spanish speaking counterparts. Almost three quarters of them have finished high school, whereas 30% of Spanish speaking adults have finished high school. English ability is highly prized by U.S. employers (Chiswick and Miller 1995; Mora and Davila 1998), and that advantage combined with educational advantage puts bilingual Latinos far ahead in the U.S. job market. While there are only slight differences in levels of employment and unemployment, Latino bilingual and English speakers enjoy higher household incomes than their largely Spanish speaking counterparts. About four of every ten bilingual Hispanics have a household income below $30,000, half the rate of largely Spanish speaking Latinos. Bilingual Latinos are about twice as likely as Spanish speaking Latinos to own their own homes. The economic outcomes of bilingual speaking adult Latinos are very similar to their Latino counterparts who only have a strong command of English. Their labor market attachment and household incomes are similar, suggesting that there are no strong economic payoffs in the U.S., on average, from profi ciency in Spanish. Although Spanish is the largest non-English language spoken in the U.S. (Bean and Stevens 2003), it seems to be little different from other non-English languages in that there are no economic returns to fluency in non- English languages in the U.S. (Fry and Lowell 2003). Much of our understanding of the language characteristics of U.S. Latinos has heretofore been based on Census data. The Census crudely measures English language abilities and provides no information on Spanish language proficiencies. It does, however, gauge Spanish language usage in the privacy of the home, instead of in the public lives of Hispanic adults in the U.S. Thus, our knowledge of the extent and nature of bilingualism, and the use of Spanish, in the public sphere has been quite limited. The richness of the information collected in the 2002 National Survey of Latinos on language proficiencies and usage substantially extends our understanding of English/Spanish bilingualism and language usage of Latinos. Judged on the basis of speaking proficiencies, English/ Spanish bilingualism seems alive and well among Latino adults. To be sure, much evidence suggests that native-born Hispanics ordinarily acquire English speaking fluency (Alba et al. 2002). The 2002 National Survey of Latinos also supports that view. Nearly all native-born Latino adults report speaking and understanding a conversation in English either “pretty well” or “very well.” The survey shows that Spanish speaking ability also is fairly pervasive among Latino adults, so that English/ Spanish bilingualism, in terms of speaking abilities, is fairly robust. One half of third-generation Latino adults report relatively proficient Spanish speaking abilities, so that the loss of speaking competence in Spanish in favor of English may not happen as comprehensively, rapidly and readily as some scholars suggest (Portes and Schauffl er 1994). Even so, some evidence suggests that Latino bilingual speaking adults do prefer to conduct their interactions in English. 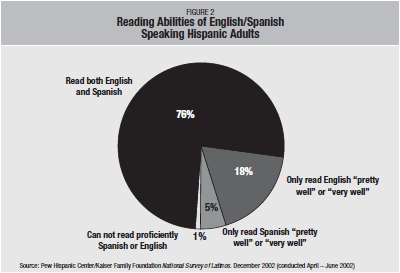 While many native-born Hispanic adults have Spanish speaking fluency, fewer report strong Spanish reading capacities. In nearly all job settings, bilingual Hispanics use English. Fewer than one in ten bilingual speaking Hispanics obtains news information exclusively in Spanish. Moreover, fewer than one in five uses Spanish exclusively at home. Since the home may be the ultimate domain for the use of a minority language, and since the home is almost exclusively the means by which foreign language ability is imparted from one generation to the next, it is not at all clear that Spanish speaking proficiency, essential to English/Spanish bilingualism as defined in this brief, will remain prevalent in successive generations of native-born Latinos. Of those who were interviewed, 2,929 identified themselves as being of Hispanic or Latin origin or descent (based on the question “Are you, yourself of Hispanic or Latin origin or descent, such as Mexican, Puerto Rican, Cuban, Dominican, Central or South American, Caribbean or some other Latin background?”). Throughout this report, they will be referred to interchangeably as either “Latinos” or “Hispanics.” In addition, interviews were conducted with 1,008 non- Hispanic whites and 171 non-Hispanic African Americans. The margin of sampling error is +/- 2.41 percentage points for Latinos overall. 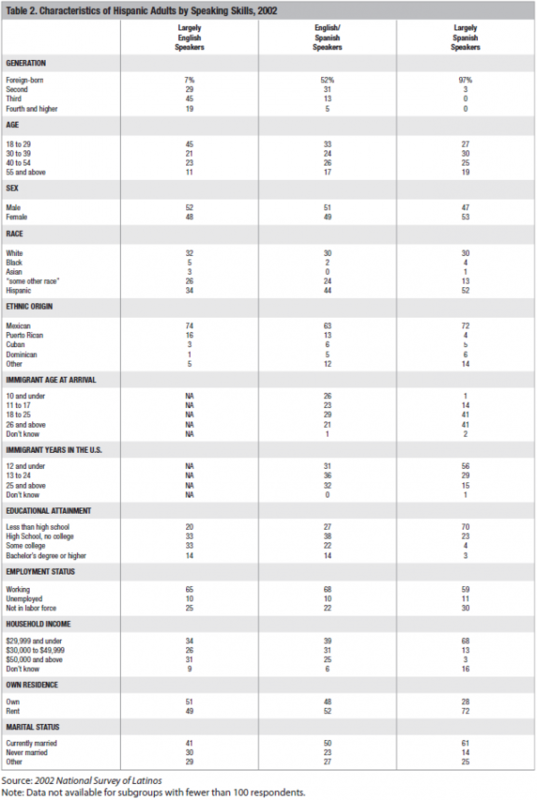 The sample sizes and margins of error for Latinos of different speaking abilities are shown in the table below. The report also highlights results for other subgroups of Latinos. Please see the introduction of the report for definitions, sample sizes, and margins of sampling error for these key groups.